Lichfield Society of Artists appoints David Poxon RI as it’s new Patron. The Lichfield Society of Artists has invited David to become a Patron of their Society. Becoming a Patron is a great honour which David has gratefully accepted. The Society has two Patrons, the other being Michel Fabricant MP. Lichfield is an historic city with a world famous cathedral in the Staffordshire region of England. The Lichfield Society of Artists is a flourishing organisation of some 140 members, dedicated to encouraging the appreciation and practice of visual arts and craftwork in the Lichfield area. The society’s membership comprises mainly amateur artists with a sprinkling of professionals. semi-professionals and art teachers. Since the society held its first public exhibition in 1945, it has provided local artists who have wide-ranging interests in traditional and contemporary visual art forms with opportunities to meet, develop their skills and exhibit their work. Live painting demonstrations, workshops hosted by invited professional artists, informal painting sessions, social events and excursions to major art exhibitions outside the Lichfield area make up its varied programme of all-year-round activities. The Lichfield society, which was founded during the final months of the Second World War, is approaching its 75th anniversary. This historic milestone will be celebrated over the course of the coming year in a series of special events and activities. The society’s progress over the course of seven decades has been closely linked to developments in the civic, economic and cultural life of the city of Lichfield. An illustrated commemorative booklet chronicling some of the highlights from the society’s fascinating past is currently being produced which will celebrate its many achievements and hopefully also serve to inspire future generations of local artists. The society’s website and social media activities have raised the organisation’s public profile in recent years, made it accessible to fresh audiences and attracted new members (www.lichfieldsocietyofartists.co.uk). The famous English Master J M W Turner painted Lichfield Cathedral. 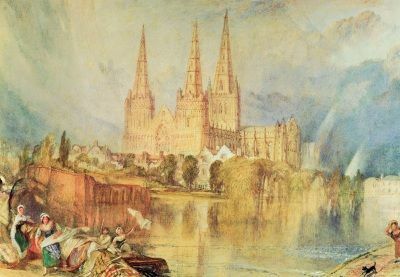 The rare watercolour painting by renowned Romanticist artist J M W Turner bequeathed to Lichfield Cathedral has been sold at London’s famed Sotheby’s auction house. The painting, which depicts the three-spired medieval structure soaring above Minster Pool as a storm approaches, was painted by Turner following his visit to Lichfield during a tour of the Midlands in 1830. 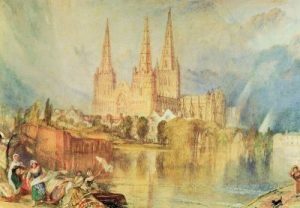 It has been confined to private collections since the influential painter’s death in 1851, until it was left as a legacy to Lichfield Cathedral last year. All proceeds from the sale will go towards the upkeep and maintenance of the cathedral. Turner’s watercolour, which went on public display at the cathedral earlier this year, was auctioned at Sotheby’s in London on Wednesday 5 July, where it was sold to the highest bidder for an incredible £310,000, thereby exceeding its estimate of £300,000. David, who is organising and curating the International Watercolour Masters Exhibition to be held at Lilleshall Hall England May 5 to 15 2020 recently received permission from Dudley Archives Museum to reproduce the famous Turner painting of Dudley Castle in the promotion for the IWM2020. This firmly links the great English Masters of the past, Turner being one, to the current contemporary watercolour Masters who will appear alongside David Poxon RI in the exhibition which is supported by The SAA.